Once you've set the date, selected a location, chosen the formality, and selected the perfect bridal gown and bridesmaid gowns that will set the mood and main color scheme for your wedding, you'll begin thinking about your wedding Wedding Bouquets. Since a walk down the aisle would not be complete without Wedding Bouquets (and a beautiful bouquet always complements the radiant glow of an ecstatic bride), your bridal bouquet is probably the first floral arrangement you will begin formulating in your mind. Generally, the wedding style and formality you choose will influence, if not determine the style of bouquet that you select. For example, if you are planning an ultra formal wedding, it's likely that your wedding gown will have a royal or cathedral length train and you'll wear a long veil. Your bouquets and other floral arrangements should also reflect this formal style. In contrast, for an informal wedding where you'll be wearing a suit or a simple dress with a sweep train or perhaps no train at all), you'll likely select a smaller bouquet, nosegay, clutch, or single-bloom style. A good rule of thumb is that your train length and wedding formality should determine the formality of your bouquet. Bouquets vary in size from small to large, but they should always be proportional in size to the person carrying it. Simple, elegant, traditional bouquet, which is suitable for both formal and informal weddings. This style of bouquet can range from the perfectly round shape to a mostly round shape and can be designed as a tight cluster for a dense look or loosely arranged for an "airy" feel. The flowers chosen for a round bouquet significantly influence the bouquet's formality. For example, roses and calla lilies project a more formal look while daisies project a more informal and casual look. A small, round-shaped, cluster of flowers not as large or as dense as traditional round bouquets. Oftentimes a nosegay contains a bow, ribbon streamers, and/or more foliage than a traditional round-shapped bouquet. A petite, round-shaped, cluster of flowers not as large or as dense as a nosegay or a traditional round bouquet. Clutch bouquets are often composed of just a few flower stems and are perfect as a budget bridesmaid bouquet or an alternate to a corsage for mothers of the bride and groom. Depending on the wedding style, a clutch may include ribbon streamers and/or be mounted in a tussy mussy (a small, Victorian style, metal or glass, cone-shaped holder). Generally round in shape, this type of bouquet consists of a simple gathering of flowers, which is bound and tied with ribbon. Some brides prefer the stems left exposed while others prefer the stems completely wrapped in ribbon to avoid staining their gown. A European-influenced, round bouquet with blossoms of different type and/or different color placed in a defined circular pattern. This style of bouquet was named for a German style of interior design. Sometimes called a teardrop, fountain, or waterfall bouquet, this sophisticated and elongated style features fullness and an abundance of blossoms at the top of the bouquet then tapers downwards with flowing foliage, floral streamers, or ribbons at the bottom. This bouquet can be designed very dense with flowers and foliage or can be more loosely arranged for an "airy" or "wispy" look. A dramatic bouquet of arching flowers and foliage that extends from the center of the bouquet and can be designed to project a traditional or contemporary look. Flowers can arch from either left to right or right to left depending on preference. There are two types of crescent bouquets, symmetrical and asymmetrical. A symmetrical crescent features a balanced look with arched blooms and foliage of the same length on both sides. An asymmetrical crescent features arched blooms and foliage of different lengths so that one side of the bouquet is longer than the other. This bouquet is a combination of both a cascade and a round. It is elongated in shape, but features rounded shapes on both the top and bottom. Generally the bottom is narrower than the top, but the overall shape resembles an oval. Sometimes an oval bouquet is a round bouquet with a few longer floral stems or sprigs of foliage protruding from the bottom. Also known as a presentation or pageant bouquet, arm bouquets feature a gathering of long-stemmed flowers that rest naturally across the inner bend of the elbow. A ribbon or bow is generally used to keep the bouquet together. Popular floral choices for arm bouquets are calla lilies, gladiolus, orchids, long-stemmed roses, delphiniums, and larkspur. This style of bouquet often has flowers or greenery placed at various angles with no specific, recognizable shape. Freeform and contemporary bouquets are most often designed with tropical flowers and foliage that have unique shapes. A bouquet resembling one large flower bloom that is created by assembling detached petals from numerous flowers. Examples of composite bouquets include the glamellia (comprised of gladiolus petals) and duchess rose (comprised of rose petals). Due to the amount of time and labor required to create a composite, this can be one of the more costly bouquets and should be created close to the time of the ceremony to lessen the risk of wilting. This bouquet resembles a magic wand in that the flowers are generally densely arranged and the stems are left very long. In place of long stems, a long bouquet holder, sticks, or other ornamentation can be used. This style of bouquet is quickly gaining popularity, particularly in Europe where many styles and trends originate. A scepter resembles a presentation bouquet except while a presentation bouquet is generally carried diagonally and in the bend of the arm, a scepter is carried straight up and down like a hand-tied bouquet. A romantic, alternative shaped bouquet featuring two, full, arched shapes at the top while tapering down to a point at the bottom of the bouquet. The heart shaped bouquet symbolizes love and romance and is popular for Valentine's Day and Sweetest Day weddings. A round bouquet composed of masses of tulle, net, or lace and a few flowers. This type of bouquet was popular in the early 1940s when flowers were scarce due to World War II. For modern brides, a ballerina bouquet offers a cost-effective, yet beautiful and romantic solution for a tight floral budget. While not technically a bouquet, one, two, and three stem hand-held arrangements are popular whenever simplicity is the trend. Often these types of designs feature a unique design element, such as an intricately wrapped stem (for long-stemmed flowers), elaborate bow, streamers, or a decorative lace bloom collar (for a shorter stemmed flower) to give the design more interest and appeal. These are good floral options for brides on a tight budget. A flower or foliage covered ball or cone suspended from a loop of ribbon. Adult attendants can carry larger size pomanders, while young attendants such as flower girls and junior bridesmaids can carry petite size pomanders. Flowers arranged and carried in a shallow basket and often used in a garden or garden-like wedding setting. Small baskets are most often carried by young attendants (flower girls and junior bridesmaids) while larger baskets are carried by bridesmaids. Made popular by the wedding of Britain's Duke and Duchess of York (Prince Andrew and Sarah Ferguson), this "bouquet" is a large ring decorated or intertwined with foliage and flowers. Generally thought of as a symbol of eternity with no beginning or end. Bridal hoops and wreaths can be made in any size, and petite floral wreaths are becoming fashionable for flowergirls to carry as an alternative to baskets. A small Bible, prayer book, or poetry book used as the platform upon which a small bouquet is placed. The design may be composed of a small cluster of flowers or may be featured as a small cascade. Generally flowers are attached with ribbon or waterproof base to prevent damage to the book. Elegant for evening and candlelight weddings, lit, covered candles or hurricane lamps are surrounded by flowers and carried down the aisle instead of bouquets. Extremely popular in the USA in the late 1970s, they are making a strong comback with brides looking for something elegant and unique for their evening weddings. For an updated look, use colored candles rather than white ones. Technically a corsage rather than a bouquet. A small floral arrangement that is designed to be worn on the wrist. Flowers and foliage are mounted on a small base, which is attached to an strong elastic bracelet that fits around the wrist. Worn by brides and bridesmaids who want something near their hands for the look of a bouquet, but want the freedom of having both hands free from carrying anything. A small bouquet or cluster of flowers attached to an elaborate fan. This style of bouquet is reminiscent of the Victorian Era, and is popular for vintage, Asian-inspired, or Southern US (1800s antibellum) style weddings. 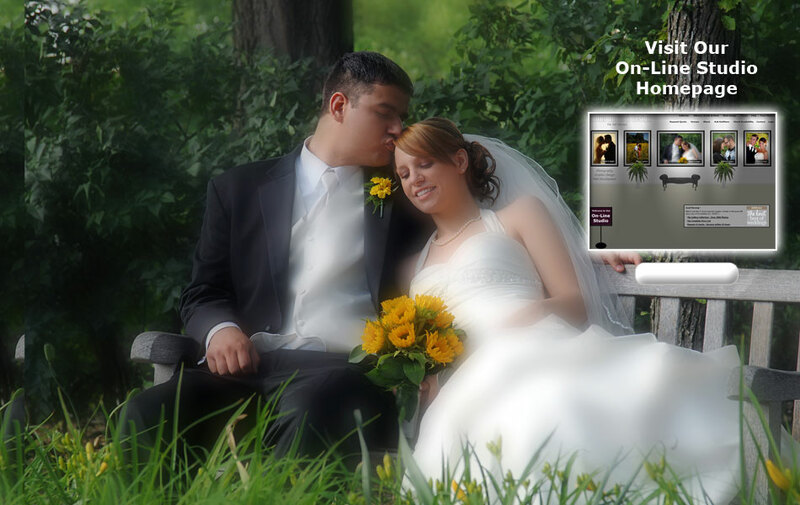 Use the links below to view additional Chicago Wedding Photography Tips as well as articles which can assist you in preparing your Chicago area Wedding. Articles include: wedding dresses, wedding shoes, wedding cakes, wedding Wedding Bouquets, wedding invitations, and more! 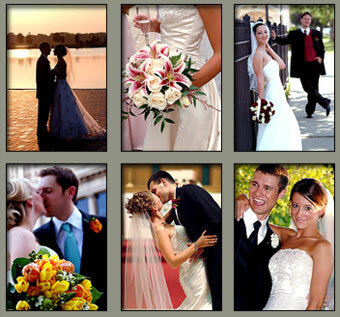 Loftus Photo & Design provides exceptional photography for Chicago Weddings. Let us be your Chicago Wedding Photographer!